There are more than 30 TESDA courses in-demand abroad. Everyone, including high school graduates, college graduates and even those who are presently unemployed are advised to study these courses to be able to land a job abroad. Countries like Hong Kong, Taiwan, Dubai, Qatar, Japan, Australia, New Zealand, Canada, and many others are in need of highly skilled individuals on a certain field of specialization. Fortunately, TESDA here in the Philippines offer technical – vocational courses that if completed, can allow each individual to be qualified to apply for in demand jobs overseas. 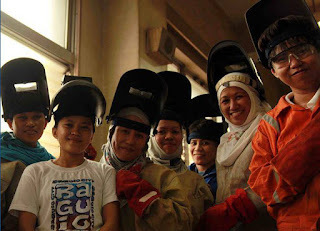 In-demand courses are offered by TESDA. According to news article from Interaksyon.com, Director General Joel Villanueva told that Qatar, Canada, and United States need pipe fitters. Malaysia, on the hand, needs welders. In addition, Filipino barbers and hairstylists are in demand in US, Middle East, and Brunei. Jewelry making, Electrical power distribution line construction and land surveying also has job openings abroad. Graduates of electrical installation and maintenance, plumbing, refrigeration and air-conditioning have higher chance of being employed in Dubai as they have more opportunities requiring such skilled individuals. On the other hand, Barista / Bartenders and commercial cooking NC graduates are needed in hotels and restaurants in different countries. In other countries like Japan, they are in need of agriculture crops production, sewers / tailors, carpenters, caregivers, and factory workers so you might as well try studying one of these courses as they have the exact value in other countries. Meanwhile, In Hong Kong, housekeepers are in-demand while Taiwan wants electronics technician that can work in semicon factories. Listed below are the complete lists of TESDA courses which are in-demand abroad. Interested technical –vocational learners just need to choose which of the following courses suits their skills. Learners who are able to complete a specific course are advised to take the assessment exam given by TESDA. Assessment centers are available nationwide. If by any chance, a test taker passed, they can have the National Certificate (NC) which represents the seal of excellence from the educational agency. TESDA graduates that have acquired NC can now apply to local companies, and/or to Philippine Overseas Employment Administration (POEA) accredited manpower agencies that deploy skilled workers abroad. Graduates who successfully land a job abroad can earn ranging $650 to $750 or even as much as PHP 100,000 per month depending on the job hired for. So what are you waiting for? Inquire now and be one of those fortunate individuals who landed a job overseas.